Approximately 900 people have walked through our doors each day this week. 900. 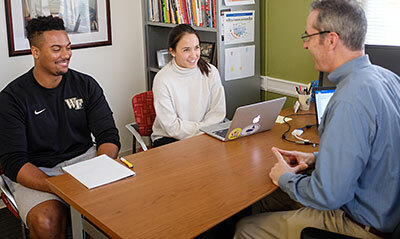 High school sophomores and juniors are visiting as prospective applicants while admitted students come to us as prospective future Demon Deacons. Let’s just say we’ve been shaking a whole lot of hands! Thus the silence on the blog. That said, there really is not much to write about. Admitted students are weighing their options and have until May 1 to pay an admission deposit to the school of their choice. Students on our active wait list know that little will happen on that front until the first week of May at the earliest. Finally, the Admissions Committee has begun to review transfer applications and will begin releasing decisions at the end of the month. We have a savvy and patient applicant pool and for that we are thankful. If you have visited us over the course of this five to six week period, thank you. 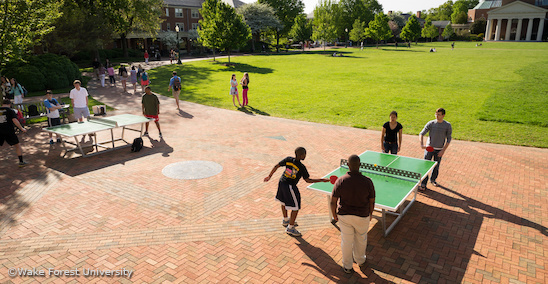 For the most part, the weather has been great (Dean Gauthier and I even squeezed in some table tennis during our first Campus Day for admitted students last Friday!). We’ve enjoyed hosting you and look forward to hearing more from you in the future. An inbox flooded with new messages from students who have been offered a place on our wait list. This is what all of us on the Admissions Committee found this past weekend after our decision letters had been mailed. I spent time responding to many Saturday afternoon and then again Sunday evening, wanting to help relieve the anxiety that comes with an offer to remain on our active wait list. 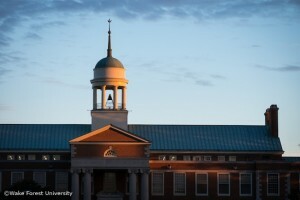 We understand and respect the fact that being a student at Wake Forest is of significant importance to so many of you. Your decision notification included information on how our wait list process works – read it carefully. What follows is some additional advice on things you need to know going forward. Obviously, you need to mail back your wait list reply card. We will not evaluate your file again without it. A simple but necessary step, send it back soon. 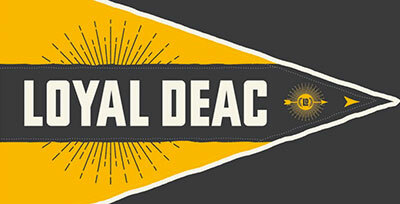 Second, email your regional admissions dean. If you are not sure who that is, visit our Meet the Staff directory. This is your chance to convey your interest in attending Wake Forest while also describing how the final months of your senior year are progressing. In particular, we are interested in knowing more about recent academic success in the classroom. Feel free to email your representative again as May 1 approaches with additional academic updates. That’s it – you need not do anything further. We do not offer interviews to students on our wait list. 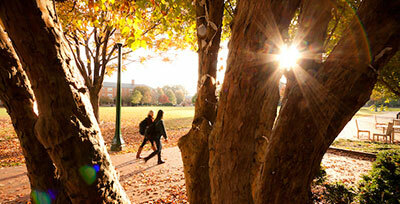 If you are curious as to whether a visit to campus will increase your chances of being admitted, know that it will not. That said, if you wish to visit so that you can know for yourself whether you would say yes should admission be offered, by all means come to campus (information on scheduling a place in our information session and tour can be found on our Visit Wake Forest webpage). Finally, you do need a strong dose of patience. We will spend the entire month of April monitoring our enrollment. Come May 1, the Admissions Committee will gather to discuss how many, if any, additional applicants we will need to admit. If necessary, we will begin the process of reviewing active wait list applications (as noted on your notification, we do not rank applications on our wait list). The calling of applicants would proceed soon thereafter. 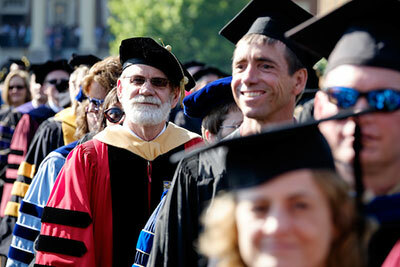 While we have admitted students off of our wait list in recent years, it is possible that this year will be different. We will not know our enrollment situation until May 1. In the meantime, you must pay an enrollment deposit to one of the institutions where you were admitted. Whatever you do, please do not risk losing your place there in hopes of being offered one here. Students, please do not hesitate to reach out to us if you have any questions. I know that being offered a place on our wait list was not the outcome you desired and I do not wish to sugarcoat the situation. Going forward, what we do not want is for confusion about this process to make your personal experience more difficult – reach out and we will do our best to answer your questions.